We are very excited to report that Sweet Harvest Honey is now on sale (and on the menu!) 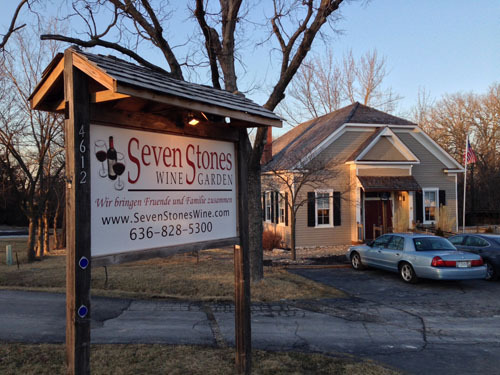 at Seven Stones Winegarten in New Melle, Missouri. Diane and I met proprietors Jim and Kelley Winistoerfer quite by accident about a month ago. I answered a Craigslist ad on a Sunday for a used compost tumbler in New Melle, and we thought it was a good excuse for a daytrip. On the way to pick up the composter, we passed a quaint-looking little wine garden, and thought nothing of it. But we were so delighted with the deal we’d gotten that we decided to celebrate by stopping for a glass of wine on the return trip. He was not even sure offhand, just knew it came from the supermarket – but when I told him we were beekeepers, he was immediately interested. Within ten minutes he’d ordered two 24oz bottles for the kitchen – one each of our light amber spring honey and the dark, molasses-flavored fall crop. When we made it back there, we also brought two small 4.5oz jars as samples, along with a lip balm and a lotion bar. “I can sell these all day long,” he said of the 4.5oz jars. While we were there, drinking wine and listening to the band, he was making the rounds with other customers, giving tastes of honey and even letting a few people try the lotion bar. By the time we left he’d placed an order for some of everything! When we went by with the order, even though it was a quiet Sunday crowd, Jim hailed us as we walked in the door and, with Diane’s help, had sold several items before we even sat down! But I think the person most excited to see us was Chef Adam, who is now using Sweet Harvest Honey in a variety of menu options. And speaking of Chef Adam, the pasta special on our last visit was a Salmon Fettuccine that was absolutely scrumptious! Now available at Brown’s AroundTheBlock in Troy, Missouri! Surrounded by Ag – and Pollinators! How Do Bees Survive the Winter?